Final Cut on Film: Justice For All? If HBO's Paradise Lost trilogy didn't thoroughly quench your curiosity in the West Memphis 3 case, the new Peter Jackson-produced doc West of Memphis has you covered – there's nary a stone unturned in its 150-minute runtime. The case which gained worldwide attention through big-name celebrities' involvement (the thoughtful Eddie Vedder is prominently featured) is laid out in comprehensive - exhaustive - fashion by director Amy Berg (Deliver Us from Evil). The crime's timeline's surgically unfurled, new witnesses are unmasked, and numerous alternate theories fly (the strongest centered on one of the boy's stepfather) as the filmmakers not-so-subtly nudge you to form sympathy for the three men - then teens - who allegedly had zero role in the gory end of three lives in rural Arkansas. But can anyone definitively prove they didn't? Don't pose that question to Jackson, a man doggedly-determined to see the WM3 freed – as the New Zealander puts it, he possesses a "pathological hatred" for injustice. And while that's readily apparent, I would have preferred Jackson's clinically-presented project display a bit more reverence for the three young lives that were brutally taken some twenty years ago. 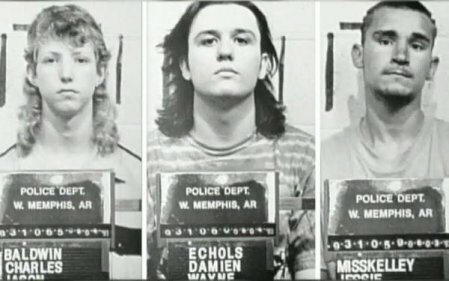 Though three men were exonerated of the crime in the courts, three 8-year-old boys will never experience the freedom now had by the West Memphis 3 – regardless of who slaughtered those young souls.